The scenario should be familiar to most - I go out with friends for a meal and come bill time, I realise I am short of cash. In these kind of situations, I usually either take all the cash from my friends and put the entire bill on my card, or I promise to do a fund transfer to the friend who picked up the tab. Either way, one party needs to transfer money while the other needs to check if the payment has gone through. And things can get pretty cumbersome especially when a long string of bank account number is involved, no? Well, not if you have Maybank Mobile Money (MMM) as your lifesaver. MMM is the first-ever mobile payment service in Singapore that allows you to pay to another Singapore-registered mobile number from your mobile phone! And considering that mobile payment is fast emerging as the most preferred form of payment and money transfer among consumers nowadays, I reckon this is one service that makes life so much simpler and easier. 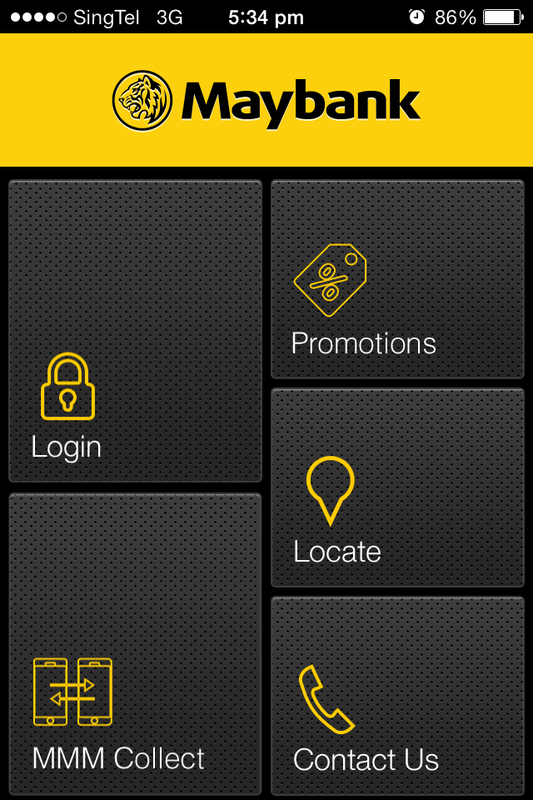 To get started, all you need is a Maybank Savings/Current account and to download the Maybank Mobile Banking App into your iPhone or Android phone (search “Maybank SG” in Google Play or App Store) or via desktop (wwww.maybank2u.com.sg/mmminfo). First-time users need to activate the service via their Security Token. 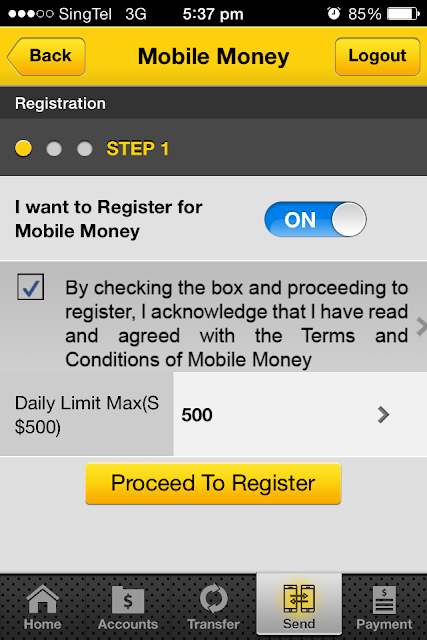 This process is done only once and you also set the daily transfer limit up to a maximum of $500. I downloaded the app and the registration process was a breeze. Before I knew it, I was already all set to make my first mobile money transfer! 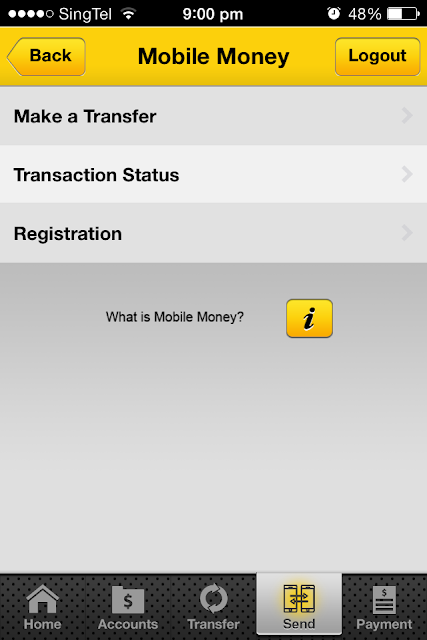 Just select 'Mobile Money' after logging in and choose 'Make a Transfer'. And here are where things get really uncomplicated. Remember the usual process of trying to record down the bank account number from your friend? For MMM, all you need is the other party’s mobile phone number! Enter the amount and your One-Time Password (OTP), and it's done. You will then receive a PIN via SMS which you will need to forward to your recipient so that he/she can 'collect' the money. And collecting money is just as straightforward as ANY PARTY can be a Collector. There isn't any need to be a Maybank customer, but the collector does need to have a Singapore-registered mobile number and a Singapore bank account. 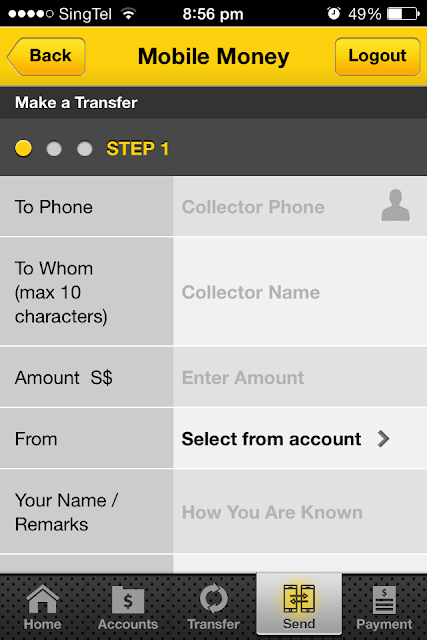 The collector also needs to download the app and select'MMM Collect' from the main menu. 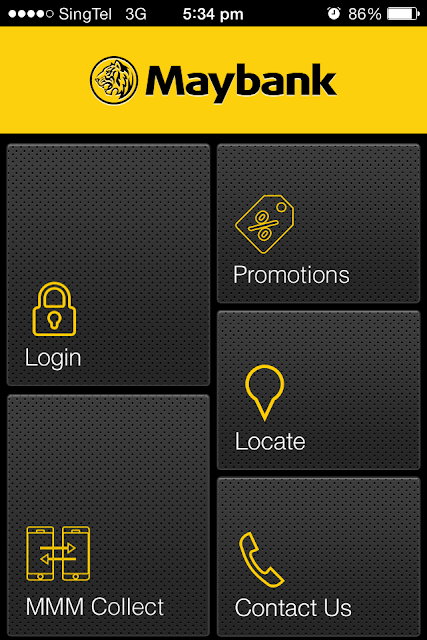 Enter your mobile number, Transaction Code (SMS from Maybank) and PIN from sender. Enter an OTP in the form of an SMS from Maybank and voila - the money will be credited immediately to your Maybank account! For other bank accounts, it will take the usual 2 working days. 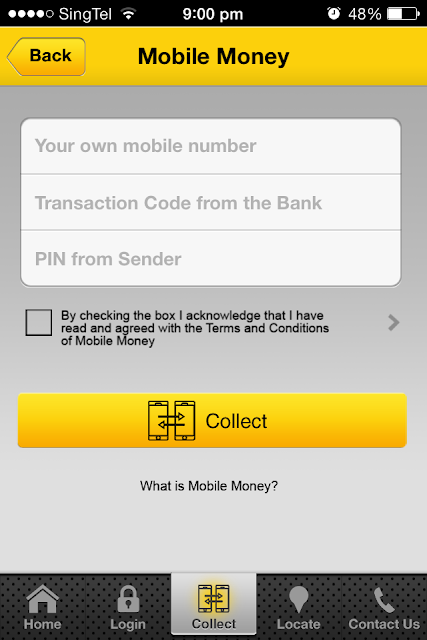 I tried transferring some money to my wife's non-Maybank account and it was as easy as it can get. The clincher has got to be the fact that payments can now be made to a mobile number. No longer do I need to be afraid of copying down the wrong bank account number of the recipient or worse, scramble to find out the bank's code AND branch code. The latter is definitely one of my pet peeves when it comes to transferring money. Oh, and not forgetting that the transfer is secured too as the Sender will receive a PIN which he/she will then send to the Collector to receive the funds. As for the Collector, the ease of collection is definitely the star benefit. He/She will be able to collect the funds into any local bank account - AND come December 2013, into any of his/her local Visa/MasterCard too! Another benefit that I like is also the fact that there isn't any need to provide my bank account information to the sender anymore, which is great news considering the increasing instances of identity theft these days. And I can already think of a few useful scenarios when Maybank Mobile Money can come in really handy, like paying the school bus uncle and swimming coach without me having to worry about the boys losing the cash or cheque. Stress-free for everyone, that's for sure! To celebrate the launch of MMM, Maybank will be running a Maybank Magic Number campaign on Facebook where ANYONE gets a shot at winning cash! Starting with registration on 18 November 2013 and the daily draw starting from 21 November to 18 December (only on weekdays), any time between 12 noon till 2 pm, a winning number (0 to 9) will be released at Maybank SG's Facebook page. If the last digit of your mobile phone number matches that magic number, you win $50! And it gets even better if you have made a Maybank Mobile Money transaction before the date of winning - because you will get an additional $50! But it will be a case of fastest fingers first as the first 5 qualified winners each day will win S$50 each. Want to increase your chances of winning? Then be sure to pop by the Maybank Magic Number Road Shows where hourly draws will be conducted at selected branches. A number will be released at each road show and participants whose last digit of their mobile phone matches the winning number will receive the prize money of $5. There will be up to 10 winners at each hourly draw and winners who credit their prize money to a Maybank Saving account will double their winnings to $10. The draws will be held at selected Maybank Branches hourly for 5 times per day and the details of the road shows, venue and time will be published at Maybank SG's Facebook page. So be sure to keep a lookout for that Magic Number, you might just get lucky!